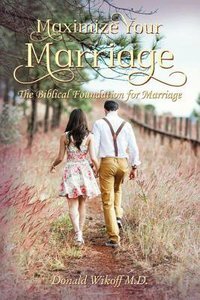 This is a book intended to assist couples in identifying what the Bible has to say about marriage. It is not intended to represent the opinions of the author, but simply to provide a structured and concise view of what the Bible has to say about marriage. Since God created marriage, He is clearly the one to know how best to live out married life to accomplish the purpose for which God created this institution. Most couples who have been exposed to this teaching have felt that their eyes were opened to Biblical truths that were previously unknown to them, or not discerned as applying to marriage. The purpose of the book is to strengthen current marriages (even mature ones) as well as better prepare young people entering into a committed relationship to help them start off on a strong and solid foundation of truth and understanding of the roles of a man and a woman in this wonderful institution ordered and blessed by God. About "Maximize Your Marriage: The Biblical Foundations For Marriage"